Our Wall Dives are famous and a must do! ST. Croix is not a volcanic island, it is a plate that has been pushed up. We have small ledge surrounding the island and then it drops off to 1 to 2 thousand feet. We are known for our wall dives. 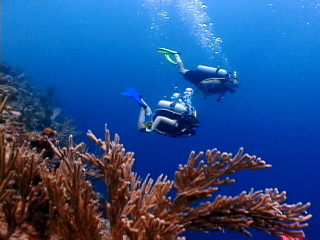 St. Croix has the second largest barrier reef in the Caribbean. Scotch Banks: A flat sandy submerged mountain top east of Christiansted harbor. Mooring is in 25 feet of water. The wall is 15 yards east, starts at 40 feet and drops to over 1,000 feet. On the top of the wall lots of pillar coral surrounded with barred soldier fish and grunts. Off the wall barracuda, angel fish, elephant ear sponge, horse eye jacks and once in a while a eagle rays, manta rays and even whale sharks. Salt River Canyon East Wall: The East Wall mooring is in 40 feet of water, the back of the boat usually hangs in 1,000 feet. Tons of sponges soft and hard corals. Two types of black coral, the green and pink ones. Lots of pelagic and tropical fish. Grouper, snapper, eels, conch, lobster and crab are found here. Usually very clear water. This is a very historical site. Columbus came here on his second trip to American. He had 17 ships with him. First time that there was bloodshed between Native Americans and Europeans. Columbus took some of the capture Indians back with him. This site is also one of the oldest geological areas in the Caribbean. A Hydro lab was here for several years. Scientist would live underwater for a week or so doing research on corals and fish life. Salt River Canyon West Wall: Mooring in 20 feet of water. A sheer drop off wall. Lots of canyons and groves to go through. Pelagic as well as eel, snapper, jacks and groupers. Some really big stingrays in the area. Great for novice divers as well as advanced. Rust – op – twist: Named after a sugar plantation. One time home to a shrimp farm. Pipes for the deep water intake still underwater. This area has the deepest water closet to shore in the Caribbean. 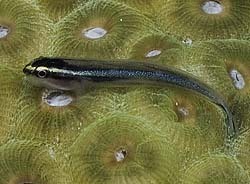 Healthy corals, black durgons snappers, lobster and eels. Black coral on the wall. Two moorings on this wall site. Dump truck: At 130 feet on a ledge is a 1930 s dump truck that is lying on its side. We believe that the trash was taken out to sea back then and the truck accidentally fell off the barge. Full of black coral and sponge life. Usually a big turtle or eel hanging out there. Great for photos. 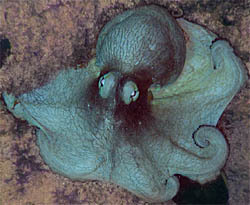 Little Cozemul: Discovered by Dive Experience this dive has a small wall starting at 40 feet and is vertical to 72 feet. On top lots of coral soft and hard. Seahorses can be found here. Nice sloping reefs with a large abundance of lobster. Both green and spotted eels live here. At the 50 foot range, beautiful corals with tons of fish life. Craigs canyon: Deep canyon starts in 40 feet sand bottom 20 feet across. Lots of over hangs. Lobster, file fish, durgons and eels. Soft and hard corals in abundance. The pinnacle: Sea mount that tops off at 90 feet. Usually see swimming reef sharks and big jacks. Black coral. Advanced divers only. The Pavilions: Beautiful wall dive east of Cane Bay. Lots of hard and soft corals, schools of Atlantic spade fish, groupers elephant ear sponges and black coral. Plateau with sand and coral, great for beginner and advanced. Cane Bay: Most popular beach dive as well as boat dive. Accessible from north shore road. 200 yard swim to the wall, drops over 2,000 feet. Beautiful wall dive. Some times reef sharks out in the blue. Black coral, pelagic and well as tropicals. Great beach. North star: Named after the sugar plantation on the shore. Vertical drop off starting at 25 feet plunging down to 2,000. Schooling fish everywhere. Davis Bay: Great wall dive. Have seen larger sharks here such as tiger and black tip. Shallows ruined by hotel construction and hurricanes.